* Monday night’s game will be a battle of first year coaches who have not lost a game at their respective schools. Oliver Purnell is in his first year at Clemson and defeated Gardner Webb in his opener last Friday, while Bart Lundy is in his first year at High Point and is coming off a victory over Allen College on Friday night. * Clemson is 1-0 against High Point. The only previous meeting took place last year in the Greensboro Coliseum, a 91-65 victory. That was Clemson’s largest victory margin of the season. 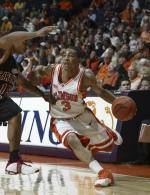 * Clemson won its 19th consecutive season opening game with its 86-55 win over Gardner-Webb last Friday. Clemson has been almost as successful in the second game of the season, posting a 16-2 record in the second game of the year during that time. * Clemson had a 59-32 rebound margin against Gardner-Webb in the season opener, Clemson’s largest rebound margin in a game since December of 1988 when Clemson had a +30 rebound margin against Wagner. * Chris Hobbs began his senior year on a strong note with 17 points and nine rebounds in just 22 minutes of play. It was the most points for Hobbs in a game since the season opener last year when he had 19 in a victory over Wofford. Hobbs got 12 field goal attempts in Friday’s game, his most field goal attempts in a game since January 5, 2001 when he took 15 shots on the way to a 25-point performance at Georgia Tech. Hobbs took double figures in field goal attempts in just one game all of last year. * Clemson’s 31-point win over Gardner-Webb was the largest margin of victory for a Clemson head coach in his first game since the opening game of the 1916-17 season when Country Morris had a 49-point win over College of Charleston in his first game as Clemson head coach. * Vernon Hamilton, a first-year freshman, started the season opener against Gardner-Webb. The native of Richmond is the first first-year freshman to start the opening game for the Tigers sinc Harold Jamison started the opening game of the 1995-96 season at center against UNC-Asheville. Hamilton was the first first-year freshman to start the opening game at point guard since Merl Code in 1993-94. * Akin Akingbala had a double-double in the season opener against Gardner Webb. The sophomore center had 10 points and 11 rebounds in just 19 minutes. He was the first Tiger to record a doubledouble while playing less than 20 minutes since Tom Wideman had 11 points and 11 rebounds in 13 minutes against Furman in 1995-96.